Oona is an herbal supplement that promotes balanced hormonal levels especially for women who are experiencing the difficulties of menopause. Oona offers different products for menopause. Oona PMS1 is recommended to be taken throughout a woman’s cycle. Oona PMS1 helps ease problems during PMS such as: bloating, anxiety, mood swings, forgetfulness, mild depression, irritability and breast tenderness. The capsule has 275 mg of chaste tree berry and should be taken once a day. Chaste tree has been found to contain several different phytochemicals that act as hormones like progesterone, testosterone and androstenedione. It also has flavanoids which react as antioxidants in your body. Oona PMS1 also has passionflower which is considered as the “bonus supplement” for extra relief as it is known to be a calming agent. Oona PMS2 consists of cramp bark and ginger extract. The cramp bark used in Oona Herbal Supplement undergoes a clean extraction process called Superficial Fluid Extraction. It helps your body sooth muscles such as the uterus to prevent cramping. They have also added ginger extract, which helps during digestion and lowering prostaglandins that accompany the onset of menstruation. Considering that there are different products available, Oona Herbal Supplements have also used several different ingredients. Black Cohosh – lessens the frequency of hot flashes. Chaste Tree Berry – helps deal with menopause symptoms. There are also inactive ingredients such as Dicalcium Phosphate, Microcrystalline Cellulose, Stearic Acid, Croscarmelose Sodium (vegetable gum), Silicome Dioxide and Magnesium Stearate. Oona Menopause Supplement has a “loading” period and a “manintenance” period. With the “loading period” 2 capsules are to be taken 3 times a day until the symptoms begin to subside which usually takes 10 days to 2 weeks. The “maintenance” period 1-2 tablets are to be taken 4 times a day. By following these directions, one box will last for about 1-1 ½ months. 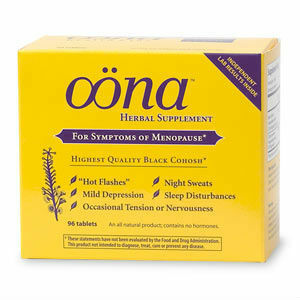 Oona Menopause Supplement is available for $29.00. You can also check on their other products online. The product doesn’t mention any money back guarantee. A lot of things need to be considered when buying products on the market especially medications that you expect to help ease your discomfort. A concern when taking Oona Herbal Menopause Support is the number of capsules that you have to take in a day to see results. Jackie Horowitz	reviewed Oona	on May 15th	 and gave it a rating of 2.